Bus price calculator with instant price for your bus! it is even easier to rent a bus with a driver. and get an instant price for your bus. At Autobus Oberbayern you don’t have to renounce an individual consulting. Throughout the whole booking process, when needed you can start a Live Chat with an expert. Which drive would you like? Simple transfer, a daytrip or do you need the bus for several days? It’s your choice with the Autobus Oberbayern bus price calculator. At our quick access you can find common requested trips to destinations in and around Munich. Regardless if you need a bus to the airport, the Allianz Arena, the Messe München or to explore the Highlights of Munich – we always have the right bus for you. You will immediately receive a price for your desired trip. Our experts will check your request and make you a non-binding offer within 24 hours. 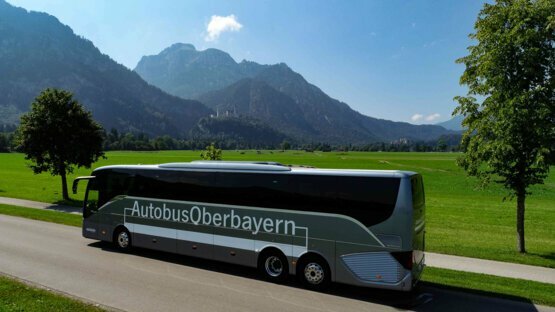 With the Autobus Oberbayern Bus Price Calculator, your journey is calculated exactly and to the nearest kilometer. So you always get the best rental price for your bus with driver. At Autobus Oberbayern you will be consulted by experienced experts who will find an individual transportation solution for you. Trust our decades-long experience.